President/CEO, Morton S. Bouchard Bouchard and B. No. 272 are now classi- ucts for Bouchard Transportation. The barge, B. No. 272, was launched by VT Halter Marine, Inc., a company of ABS and USCG certi? ed for Jones Act acting requirements of the offshore in- at VT Halter’s Pascagoula Operations Vision Technologies Systems, Inc. service. dustry around the world,” said Morton in Pascagoula, Miss., on November 20, The B. No. 272 measures 628 x 91 x 47 The Donna J. Bouchard is a 10,000 S. Bouchard III. ZERO-WASTE energy from waste and ? 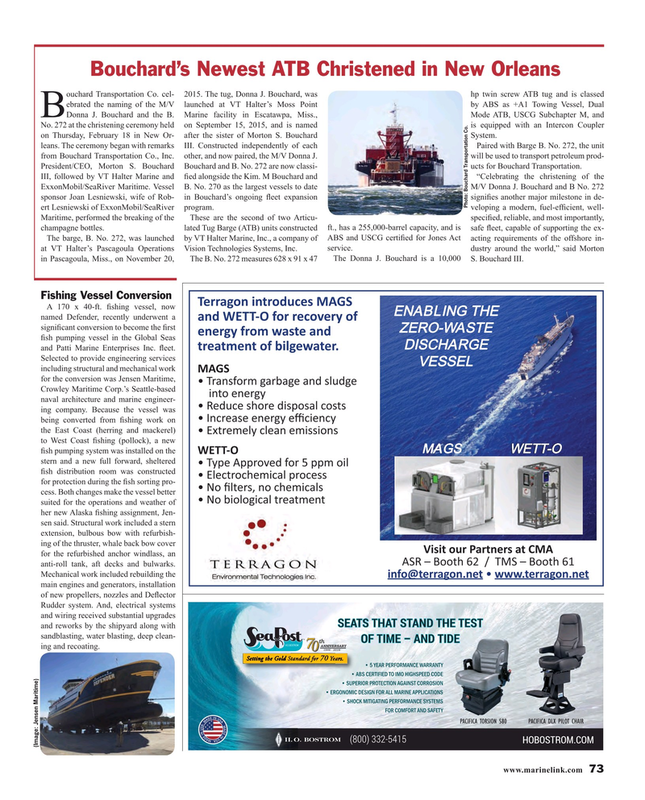 sh pumping vessel in the Global Seas treatment of bilgewater. DISCHARGE and Patti Marine Enterprises Inc. ? eet. Crowley Maritime Corp.’s Seattle-based sYlŽGYG?O? naval architecture and marine engineer- ?ZGE?ÐG?SŽ?GEs?ÐŽ?AuÐŽ?l? ing company. Because the vessel was ?/YÐ?GA?GGYG?O?G?ÐsGYÐ? being converted from ? shing work on the East Coast (herring and mackerel) ??l?GwGu?ÐuGAYGws??sŽY? WETT-O stern and a new full forward, sheltered ?d?ÐGÐÐ?Ž|GEIŽ??ÐÐwŽsu ? sh distribution room was constructed ?uGÐl?ŽÐSGwsÐAuÐ?ŽÐG?? for protection during the ? sh sorting pro- ?EŽIulG???YŽÐSGwsÐAu? Visit our Partners at CMA for the refurbished anchor windlass, an ^Z?ŽŽlS???dD^?ŽŽlS?? anti-roll tank, aft decks and bulwarks. ANNIVERSARY 77777777777777777777777777777777777777777777777777777777777777777777777777777777777777777777777777777777777777777777777777777777777777777777777777777770 ing and recoating.